Turkish Science Fiction has come a long way and it will not be long before Turkey produces world class sci-fi. 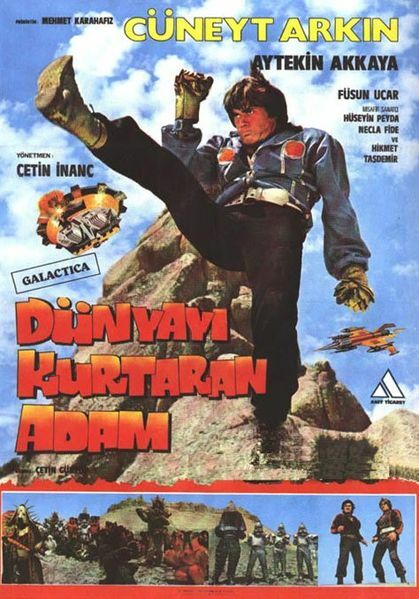 Long before Sadik Yemni, GORA, Book of Madness etc there was Dünyayı Kurtaran Adam or The Man Who Saved the World. It was one of those movies which are so bad that they are good. The movie is famous for its over the top premise and using unauthorized footage from Star Wars as well as the US and the Soviet space program. The premise is that Murat and Ali are friends who crash land on a planet. While trekking across a desert on the planet they speculate that the planet is inhabited only by women! It is not clear how they came up with that premise but lets grant them this premise for now. One of them uses his special whistle to attract women (yes there is such a thing in this movie) but instead of women they get skeletons on horses. Later on we run into 1,000 year wizards from Earth, Zombies, golden ninjas, space swords, golden human brains etc. The film was universally panned by critics in Turkey but understandably this movie has gained a cult following.